Those broken-spined, ruffle-paged books I so love have recently floated to the top of my reading list again, not merely because they’re so easy for me to read and because I love them. Well, it’s a bit because I love them. I have started rereading my very favorite books, studying how the writers structure sentences, the words they choose, and how they move the action along. I figured, I’m a writer, and I should take advantage of these resources to see if I can figure out what I like about the writing I like. I felt like I should include some Serious Books in that list. When I used to take out a dozen fantasy books at a time from my hometown library as a child, I’d have to include one or two classics or nonfiction so it would feel legitimate when I showed my mother my haul. (You know, toss a Charles Dickens in with all that Anne McCaffrey) But let’s be real. There are plenty of serious nonfiction books I like, but the books I read for pleasure are generally fiction, so I should study those while trying to identify writing skills that I could apply to my own writing, both fiction and nonfiction. Learning from books I hate. 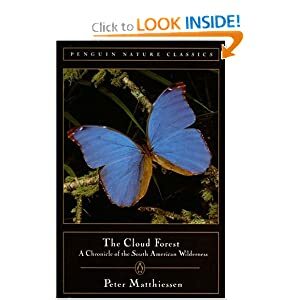 At the same time, I recently struggled through a beast of a book for a graduate school class in nature writing: The Cloud Forest by Peter Matthiessen. I am perfectly happy to accept that he has written excellent books. I am even perfectly happy to accept that maybe this simply doesn’t strike a chord with me. But I hated The Cloud Forest. I was ready to mutiny and burn this book out of pure boredom and betrayal of what I assumed was an unspoken agreement every writer makes with their readers. I have always assumed that there is a contract between the writer and the reader. Something along the lines of “I went to all the trouble of writing and publishing this book because I believe it will be worth your while to read it.” So therefore, I feel that either I am going to learn something from a book, or I am going to be entertained. had given you some practical advice. However, in this case, I felt like I was doing Matthiessen a giant favor by toughing it out through his book. It felt like he thought to himself one day, You know what, Peter old chap? You went to all that bother of spending so much time in South America, you should get some credit for it. Publish your journal, go on. It’ll be great! I considered whether it was the structure of the story that I didn’t enjoy: it is written chronologically, diary-style. But so was The Diary of A Young Girl by Anne Frank, and that was interesting...and she was trapped in an attic, not travelling through the wilderness of South America! The problem that I had with The Cloud Forest is simple: I wasn’t entertained. This is not South America, but it's more interesting. In a 269-page book, the first 150 pages were sleep-making to me. It’s almost like Matthiessen didn’t know what he was about trying to write a book. Or maybe this sort of day-by-day style was considered the way to chronicle a journey at this point in time. I would guess that my grandfather would have enjoyed it. (Honestly, I think he would have enjoyed it. I'm not making a negative statement about generations.) But I expect a storyline or a point or...something. A rather interesting storyline starts around page 150. It was as though a different person was writing. I began getting a sense of who Matthiessen was, as a person/character, and he described others quite well too in their expeditions. Had I been Matthiessen’s editor or even a good friend (who could give him a friendly word to the wise) I would have advised Matthiessen that his story starts at Chapter 6, and he should cut the junk at the beginning. So I decided to using my seething hatred of this book as a tool. I identified what exactly I hated about it: I was bored, I expect to be entertained, I was frustrated that he didn’t describe various animals, I was angry that he didn’t explore people who sounded interesting, I was annoyed that I had to wade through 150 pages of crap to get to anything worth reading. I expect writers to only release writing that they truly believe is worth my time to read it. I should take the time for a good solid editing process, or at least a good friend. What patterns do you notice in writing you love vs. writing you hate?